High blood pressure and hypertension develop over time from a combination of eating habits, lifestyle, your age, and in many cases genetics. Yes, you can inherit this. The dangers of allowing high blood pressure to persist cannot be overstated. A wide variety of potentially serious health risks – including sudden death – are related to high blood pressure and hypertension. In this article, the team at Foot Palace compiled extensive and important information about the definition, causes, potential hazards, and ways to control high blood pressure. 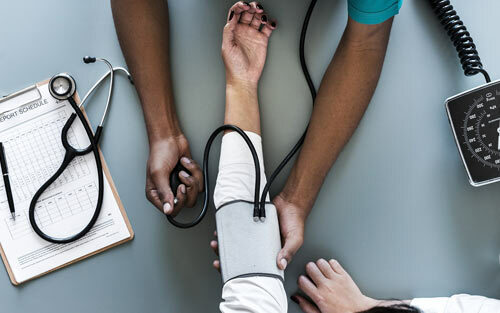 High Blood Pressure – This is a symptom occurring when the systolic BP reading is above 140 mmHg (millimeters of mercury) and the diastolic BP reading is above 90 mmHg. A high BP reading is often an acute symptom of stress, anxiety, or other external factors. Hypertension – When a person’s blood pressure is consistently or chronically elevated, it may be diagnosed as hypertension. By definition, hypertension is a medical condition of the cardiovascular system characterized by long-lasting elevated blood pressure. Given hypertension can exist quietly, it can progress to advanced stages quickly. If your blood pressure is in the prehypertension range, it is likely that you will end up with chronic high blood pressure unless you take action to prevent it. Without taking action and making significant changes, stage 2 hypertension may quickly develop into a stage 3 or stage 4 condition. “Looking for a list of symptoms? If you are looking for a list of symptoms and signs of high blood pressure (HBP or hypertension), you won’t find them here. This is because most of the time, there are none. Myth: People with high blood pressure will experience symptoms, like nervousness, sweating, difficulty sleeping or facial flushing. Once you’ve been diagnosed with any of the four stages of hypertension, you may need to take a close look at your lifestyle, eating habits, and external stressors. Through substantive changes, constant vigilance, and possible medical assistance, it is possible to lower your blood pressure and keep it under control. The following activities or a combination of them may result in the lowering of your chronic high blood pressure. 1. Maintain a Healthy Weight – Your weight is a factor that heavily influences your blood pressure; this body mass index (BMI) calculator will help you assess your current situation and determine your ideal weight target. “People who are overweight or obese are at higher risk for chronic conditions such as high blood pressure, diabetes, and high cholesterol. 2. Quit Smoking – There is no healthy amount of tobacco consumption. For those with hypertension, cessation is considered one of the best things (treatments) that can be done. The American Cancer Society has a help page on “How to Quit Smoking or Smokeless Tobacco”. 3. Reduce and Limit Alcohol Consumption – For those that consume alcohol, limiting it to one drink a day for women and two per day for men has the potential to lower your blood pressure by approximately 4 mmHg. 1 drink is the equivalent of a 12 ounce beer, 5 ounces of wine, or 1.5 ounces of 80-proof liquor. Be cautioned that consuming more than moderate amounts of alcohol may potentially interfere with blood pressure medications or cause a several point rise in your blood pressure. 4. Exercise or Increase Physical Activities – 30 minutes of regular exercise 5 days per week can potentially lower your blood pressure by 5 to 8 mmHg. Consistency is a key factor with exercise, if you simply stop exercising, your blood pressure will likely rise again. Aerobic exercises that may lower your blood pressure include walking, jogging, cycling, or swimming. Consult your doctor about developing an appropriate exercise regiment for your particular situation. 5. Develop Better Eating Habits – A diet that is low in saturated fat and cholesterol, but rich in whole grains, fruits, and low fat dairy can potentially lower your blood pressure up to 11 mmHg. While the effect of sodium intake on blood pressure varies among groups of people, even a slight reduction can lead to a reduction of up to 5 to 6 mmHg. For most adults, the lower the intake, the better – 1,500mg per day or less. 6. Schedule Spa Days and Massages – Reduce stress by making time for enjoyable activities such as taking a spa day or making it a couples massage with a loved one. 7. ACE Inhibitors – Angiotensin Converting Enzyme Inhibitors (ACE Inhibitors) are a category of medications that slow the activity of the enzyme ACE, which in turn decreases the production of angiotensin II. This results in the enlarging or dilation of blood vessels which results in the lowering of blood pressure. 8. Diuretics – In cases where ACE Inhibitors aren’t enough to reduce high blood pressure, your doctor may prescribe a diuretic to be taken with the ACE Inhibitor. Diuretics remove salt and excess water or fluid from the body. Lower fluid levels means less blood volume, thus a lowered blood pressure. Besides regular visits to your doctor, there are several ways you can monitor your blood pressure. This will help you track your progress, and help your doctor make or suggest alterations in you’re prescribed treatment(s). 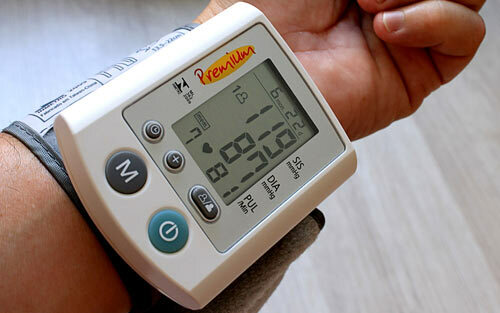 Blood Pressure Monitor – Visit your local pharmacy. They will likely carry a variety of BP monitors for you to choose from. There are those that come with an arm sleeve, ones that go around your wrist, and some that attach to your finger. Nearly all of them are battery operated with a digital readout and work with the push of a button. Smart Watches – While most smart watches will only track your heart rate, there are some that will also take your blood pressure. Watch the following video to see how this works. Blood Pressure App – If you search “blood pressure” in your app store (on your Mobile device), there will be a series of apps to help monitor blood pressure, weight, pulse, heart rate, etc. Choose one that fits your needs and install it. Most of them will keep running records and help you gage your progress. It is suggested you create a journal, or find a downloadable chart and track your blood pressure on a daily basis. Staying aware of your numbers and which efforts are impacting your numbers is great information on the road to improve your blood pressure. Knowing that there is a blood pressure problem is the first key to solving it. Once you have determined contributing factors to your situation, the responsibility is ultimately yours to make the necessary lifestyle changes. Implementing and being consistent in the above suggestions may improve your condition and lead to quantifiable results. These results are needed for to get your BP under control and maintain it. As with most other illness, the stages of hypertension can be managed through the consistent management of your diet, exercise, habits, weight, and stress. In the case of hypertension, these actions are beneficial and may result in a longer, better quality life. Filed Under: News Tagged With: Blood Pressure, Blood Pressure App, Blood Pressure Monitor, BMI, Body Mass Index Calculator, Couples Massage Athens Ga, Diastolic, High Blood Pressure, High Blood Pressure Symptoms, How To Lower Blood Pressure, Hypertension, Massage Athens Ga, Prehypertension, Systolic, What Are The Stages Of Hypertension?, What Can Lower Blood Pressure?, What Is The Normal Blood Pressure Range?, What Number Is High For Blood Pressure?